Sure, it’s the third most-populated area in the state of Queensland, but somehow the Sunshine Coast has remained one the country’s best-kept secrets. Let the other travellers have their Gold Coast and their Central Coast. You know which coast is the best coast. Only Sunshine Coast has the ruggedly beautiful Glass House Mountains and the Australia Zoo in addition to its stunning beaches. Not to mention fewer crowds and a village in the hinterland known entirely for cheese. If you can think of anything better than a getaway filled with pristine beaches, cuddly koalas and handmade cheese, well, you’ve got us beat. 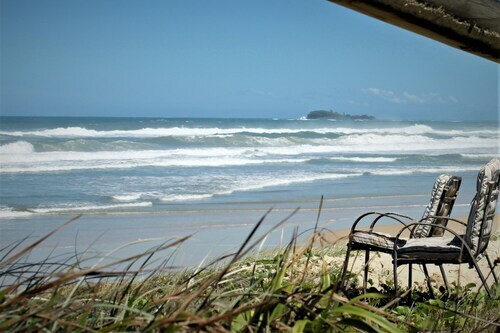 We bet you can’t, though, so it’s time to start thinking about places to stay in Sunshine Coast and what to do once you get there. How do I get to Sunshine Coast from the airport? Your adventure kicks off when you land at Sunshine Coast Airport (MCY), 13km from Mooloolaba and 31km from Noosa Heads. Shuttles and taxis are available to get you to and from your hotel. 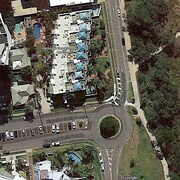 If you’re arriving late at night and want to flop near MCY, check out Wotif’s Sunshine Coast hotel deals near the airport. 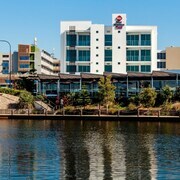 What are the most popular hotels in Sunshine Coast? 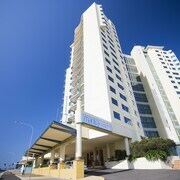 What kinds of hotels are there in Sunshine Coast? There are all sorts of hotels here, but there is one thing you can count on: Sunshine Coast hotels are sure to let you enjoy those famous rays the area is known for. Relax by the pool or out on your own private balcony at Grand Palais Beachside Resort, an apartment hotel in Mooloolaba. Book affordable accommodation like Alex Beach Cabins and spend your cash shopping at Sunshine Plaza and dining al fresco on Alexandra Parade instead. 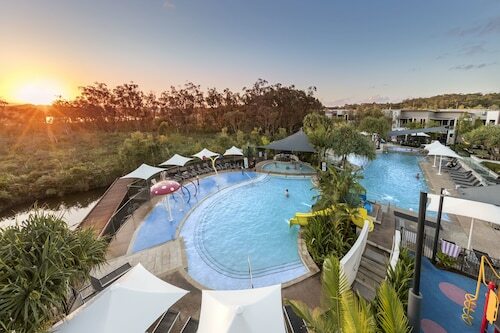 Go for the splurge at Sofitel Noosa Pacific Resort, where you’ll be steps from Noosa Beach and the botanic gardens—if you can bring yourself to leave this luxury hotel. 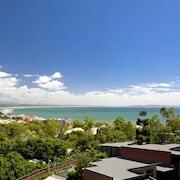 Where should I stay if I’m visiting Sunshine Coast? With over 60km of coastline, plus the wild forests and mountains of the hinterland, you’ve definitely got some decisions to make. If you want to be in the middle of it all—and also enjoy making cow sounds when you say the name of your ’hood—book Sunshine Coast accommodation like Newport Mooloolaba. Looking to get back to nature? You’ve got choices galore up in Noosa Heads. Be waited on hand and foot at Noosa Springs Golf Resort & Spa, or enjoy your own kitchenette when you check into At The Sound. If you hear the hinterlands calling, get way out there with a stay at the secluded Yabbaloumba Retreat. Say “cheese” in nearby Kenilworth, famous for its dairy farms. What are some things to do in Sunshine Coast? Hang loose, dude. Wherever you’ve got accommodation in Sunshine Coast, the local pros are waiting to teach you the basics of the cowabunga. Try Noosa Learn to Surf or Maroochy Surfschool. Head to Noosaville’s Gympie Terrace and sink your teeth into fresh fish and chips or hit the trendy waterfront spots on Mooloolaba’s Esplanade. Make your way 30km southwest to the Australia Zoo. Yep, it’s the one made famous by the late, great Steve Irwin. Keep moving south and you’ll hit “Brizzie”, a great day trip—or overnight, if you’ve got Brisbane accommodation from Wotif. Ready to be walking on sunshine? (“Whoa-oh! And don’t it feel good!”) When you bundle your airfare and accommodation with our Sunshine Coast packages, you’ll feel better than good—you’ll feel great. And that’s the kind of holiday you’ll have, too. How Much is a Hotel Room in Sunshine Coast? 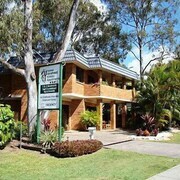 Hotels in Sunshine Coast start at AU$95 per night. Prices and availability subject to change. Additional terms may apply.